Emily is originally from Bloomington, Indiana. She and her now-husband, Sam, originally moved to Telluride in 2008 and made their way to Boulder in 2014. She grew up playing soccer and her experiences through the sport have instilled in her a strong work ethic and a value for teamwork. These skills have served her well throughout her personal and professional life, and being a part of the community has given her a solid framework on how she wants to live the rest of her life. When Emily found this style of training, she was instantly hooked and found herself progress from taking classes to sticking around longer after classes were finished to getting her level 1 certification to become a coach. 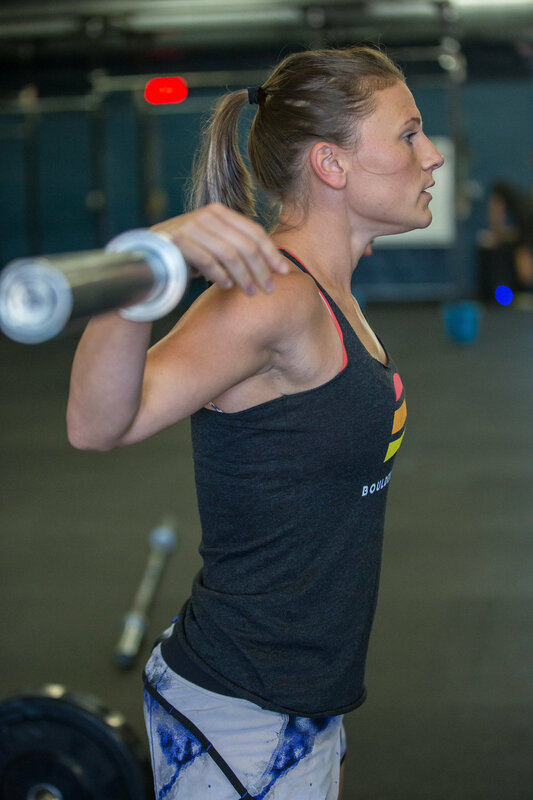 Personally, training helped Emily to not only gain physical strength, but mental and emotional strength as well. What keeps her committed and always coming back is the fact that she will never reach a stopping point where she has done all she can. She will always be reaching for something more and pushing herself to try something new. Through her coaching, Emily demonstrates to members that it’s okay to try something new, fail, and start over again, all that matters is that you try. She loves that anyone can come into the gym, and not only succeed but excel in their personal goals. Watching the members grow, conquer new personal records and leave class with the feeling of success and desire to continue to push themselves is the best part of her day. Emily has always enjoyed being a student and still keeps herself curious as ever, reading, listening to podcasts and taking classes to learn from other coaches. When she isn’t in the gym, Emily loves to try out new recipes, trail run with her dog, Gus, while pushing her son Hank in the stroller, and camp with her boys.